Making the Poker Copilot demo video work on an iPad? Poker Copilot has a nice demo video. (Watch it if you haven’t seen it.) I recently got myself an iPad. The video doesn’t work on an iPad. That’s because the video uses Flash, and Flash is absent from iPads. Video, in this YouTube era, should by now be easy to supply. Sometimes we in the software industry make a real hash out of things. The Poker Copilot user guide is now available in French. For now it is only available as a PDF, although I intend to make it a series of HTML pages too. Get it here. Anyone who uses spreadsheets expects it to be easy to add a summary row to a table. In Java (the computer language I use for Poker Copilot), it is not easy. The language designers didn’t foresee the need for summary rows, so it involves some pretty nasty programming. Which is why, until now, Poker Copilot hasn’t had summary rows. The next version will finally add this, in the Stake Level summary, the Hand Type summary, the Position summary, and the Day summary. Poker Copilot 3.13 is now available to download. Fix for Merge Network – if a player “rabbited”, tracking for that table stopped. This update needs to update your database. 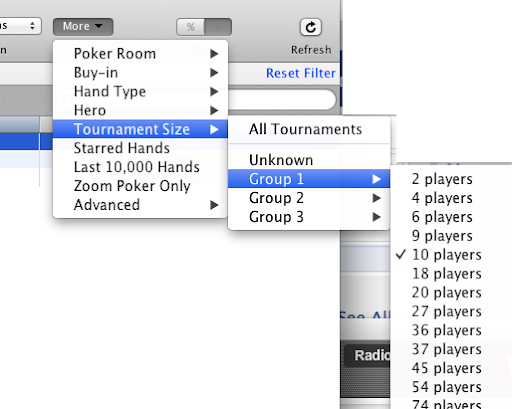 The next update of Poker Copilot will let you view stats for tournaments only with a specific number of players. This has been one of those long-time, low-priority requests that I’ve finally found time for. 2) The hand history files seem to partly anonymise player names. This makes it hard to build up a database of player statistics. You might encounter the same player on five different tables, and each time the player’s name will be different. Until this changes, hand tracking is not useful. As soon as Lock releases a native Mac version, I’ll reassess. On the 2+2 poker forums, a customer support guy for Lock says there is something in the works. However, I’d expect it to be some months before they will have it complete. 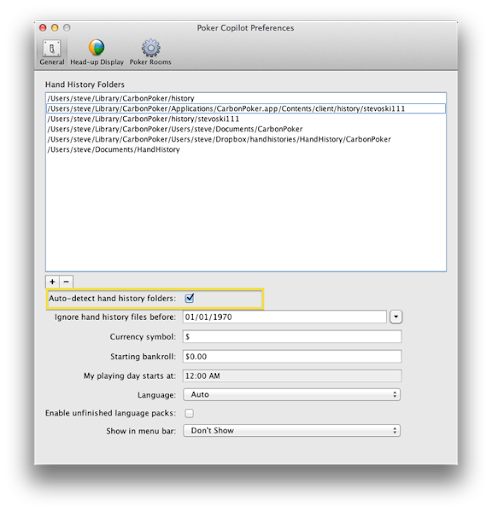 Poker Copilot 3.12 is now available to download. Thanks to all who helped solve the problems with this. Reps from Merge Network and BlackChip Poker were helpful too, which I appreciated as they are doubtlessly stressed and overworking at the moment with the pressure of dealing with the teething problems of the major changes to Merge Software. Now that a week or so of dealing with changes to Lock, Merge, and PartyPoker, and the introduction of PokerStars.ES (Spain) is over, I’m looking forward to a hopefully calm weekend. Are you playing on Merge Network? I’ve worked hard today to solve the problems between Poker Copilot and the Merge Network update from a day or two ago. Due to the sheer number of Merge partners, I haven’t been able to test this fully. Nor have I been able to test it on a multi-table tournament (or multi-table SnG) yet. So that’s what I’m asking Merge players to download this unreleased update and give it a try. Please let me know in the comments which Merge Network room you are on, and how it worked. The update will try pretty hard to locate your Merge hand history files IF you have the “Auto-detect hand history folders” checkbox checked in Poker Copilot’s Preferences. 1. Download the test version here. I’ll add a work-around and make an update available later today. Merge poker rooms such as Carbon Poker released an update overnight. Unfortunately there seem to be initial problems with this update. 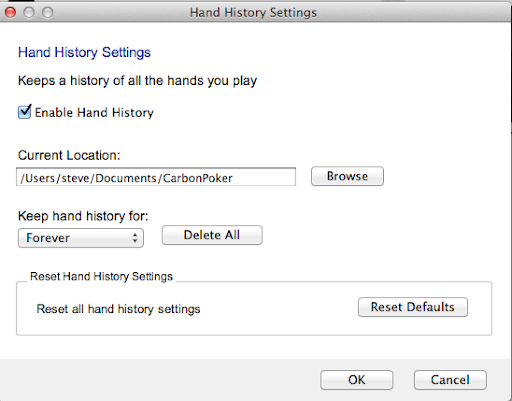 For me, at least, Carbon Poker is no longer saving hand history files, even though I’ve checked that it is enabled. What this means for Poker Copilot: until Merge fix this, Poker Copilot won’t work with Carbon and other Merge Network rooms. 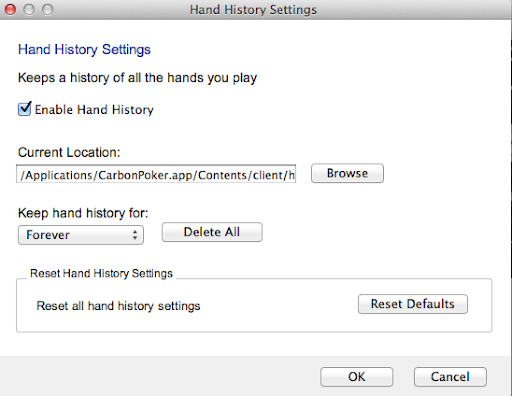 There is no work-around; without hand history files, Poker Copilot has no data! Sorry. Has anyone successfully got the new Carbon client to save hand history files? My first suspicion is that the problem was Carbon’s default location for saving hand history files – into the App’s own bundle. This is a no-no on Mac OS X – the app bundle should be considered read-only. I tried changing to another location but still had no joy.